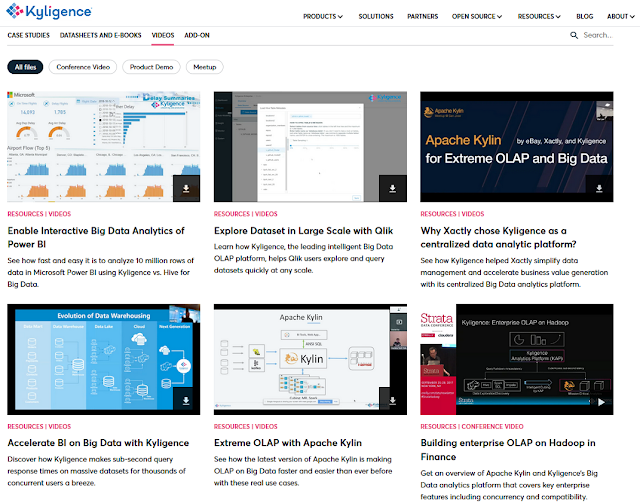 Extreme OLAP tutorial con Apache Kylin - Kyligence ~ Business Intelligence y Big Data: ¡Aprende Gratis sobre Analytics! See how fast and easy it is to analyze 10 million rows of data in Microsoft Power BI using Kyligence vs. Hive for Big Data. Learn how Kyligence, the leading intelligent Big Data OLAP platform, helps Qlik users explore and query datasets quickly at any scale. Why Xactly chose Kyligence as a centralized data analytic platform? See how Kyligence helped Xactly simplify data management and accelerate business value generation with its centralized Big Data analytics platform. Discover how Kyligence makes sub-second query response times on massive datasets for thousands of concurrent users a breeze. See how the latest version of Apache Kylin is making OLAP on Big Data faster and easier than ever before with these real use cases. Get an overview of Apache Kylin and Kyligence’s Big Data analytics platform that covers key enterprise features including concurrency and compatibility. Learn how Apache Kylin is being adopted in China and Japan with real use cases and best practices you can apply to your own Big Data efforts. Learn how to get started with Kyligence Insight for Superset and start accelerating your Big Data analytics and time to insight today.